This story originally published in Naples Daily News. Taste of Immokalee hopes to grow its local roots through a new “socially responsible” investment fund. The business, started and run by Immokalee High School students, wants to raise at least $250,000 to expand its reach, grow its entrepreneurial program and bring its manufacturing operations closer to home. The company, started three years ago, sells hot sauces, spices, salsa and barbecue sauces made from recipes created by the students. Products are sold online at tasteofimmokalee.com and in local stores, including Publix, Winn-Dixie and Wynn’s Market. Hoping to raise capital to grow their business, students made a pitch last summer to the Tamiami Angel Fund II, a Naples-based “Shark Tank”-style fund that invests in promising young companies. Investors didn’t bite, feeling uncomfortable about buying into a company whose management, including its CEO, changes as often as its students graduate. But the conversation between the students and investors continued, leading to the creation of a new kind of community investment fund that’s raising money solely for Taste of Immokalee. Tamiami Angel Funds partnered with the Community Foundation of Collier County to launch the investment fund. Through the fund, investors can make a tax-deductible donation to Taste of Immokalee, which couldn’t happen otherwise because the business operates as a for-profit corporation. Donations will benefit low-income families in Immokalee by promoting entrepreneurship and creating jobs â€” something Cartwright is passionate about in Collier County. Investors with Tamiami Angel Funds have donated more than $10,000 to the new fund. They plan to give more, and they’re hoping others in the community will step up to add to their contributions. Cartwright said he knows of no other social, or impact, investment opportunity in Southwest Florida like the fund. But he expects it to lead to more local investment vehicles like it in the future. Taste of Immokalee is set up as a “benefit corporation,â€ a hybrid between a nonprofit and for-profit company. It seeks profits and pays taxes, but it has a mission for public benefit, which in its case means giving back to Immokalee through donations. “It’s not all about growing the company and enhancing your profits,” said Steve Stolz, who sits on Taste of Immokalee’s adult board of directors. One of the primary reasons for raising money is to move Taste of Immokalee’s production line closer to home. Manufacturing is done in Sarasota, but a co-packer in eastern Collier County has expressed interest in taking over production if Taste of Immokalee can contribute $30,000 toward purchasing the necessary equipment, which could cost $60,000 to $100,000, Stolz said. Taste of Immokalee also is raising capital to expand its marketing, which is extremely limited on the current operating budget, Stolz said. More money also is needed to involve more students and to pay them for all of the hours they work. Some of the students in the program work second jobs because they need money to help support their families and to go to college. The capital also could be used to hire a few full-time sales agents to work with the students. The high school students can work only part time because they have classes, after-school activities such as clubs and sports, and homework. Mostly, the students work on the weekends, stocking shelves, checking product quality and packaging products for final delivery at the warehouse. They meet weekly to learn about running a business. Taste of Immokalee has just one full-time worker on its staff, Marie Capita, who mentors the students and is the company’s executive director. Moving production back to Collier County is key, she said, because it would help the students be more involved in business aspects from food quality to labeling. Taste of Immokalee recruits students from Immokalee High. About 24 students sign up for the program each year, but the number who stay involved usually dwindles as the workload of running the business is realized, especially by those with second jobs, Capita said. Students start at minimum wage. Those who stay with the program move up the ladder, giving them more responsibility, more learning opportunities and more pay. With more capital, Taste of Immokalee could offer more paid full-time internships in the summer, Capita said. She expects the company to have eight this year. Some of Taste of Immokalee’s original founders are still involved, although they have gone off to college. They have told Capita that some of what they’re learning in accounting, marketing and other college classes is like what they already have lived through with the business, giving them a unique perspective. Some of the founders sit on a student board, attending regular meetings by phone and working on finding new avenues to sell the products. One University of Florida student is trying to get the products into a campus store selling student-made merchandise. 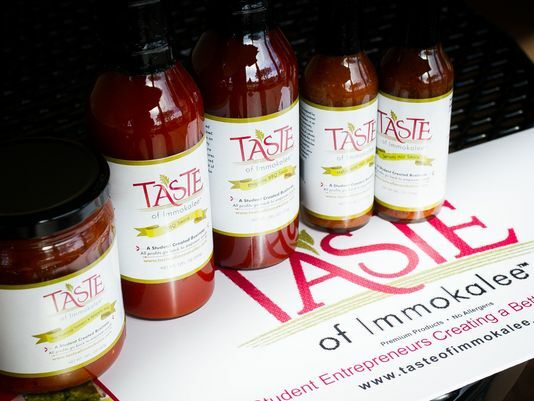 The college connections have led to other ideas, including selling Taste of Immokalee’s salsa and sauces during football games and promoting them as products that parents can include in care packages to their kids. Some of Taste of Immokalee’s more immediate goals are to expand brand awareness in Southwest Florida and its local footprint in Publix stores. Publix agreed to offer the homegrown products in all of its grocery stores in Collier and Lee counties, but the business didn’t have the means to expand into Lee, where there are more than 30 locations to supply. The faith-based nonprofit 1 By 1 Leadership Foundation helped students start Taste of Immokalee in 2014 with the help of grants from insurance giant State Farm. Eileen Connolly-Keesler, president and CEO of the Community Foundation of Collier County, said her organization has never been involved in a fund like the one created for Taste of Immokalee, one that supports entrepreneurship. The foundation manages more than 510 funds, collaborates with more than 400 nonprofit organizations, holds almost $143 million in assets and has distributed more than $102 million in grants to nonprofit groups and community programs. Through the Taste of Immokalee fund, investors are donating their shares in the company to the community foundation. That means the foundation one day could benefit from the sale of those shares if Taste of Immokalee takes off, which could raise additional dollars to steer toward economic development and entrepreneurship, Connolly-Keesler said. Interested investors should call 239-262-6300 or see tamiamiangels.com and click on Taste of Immokalee.